Sepang was the future once, you know. 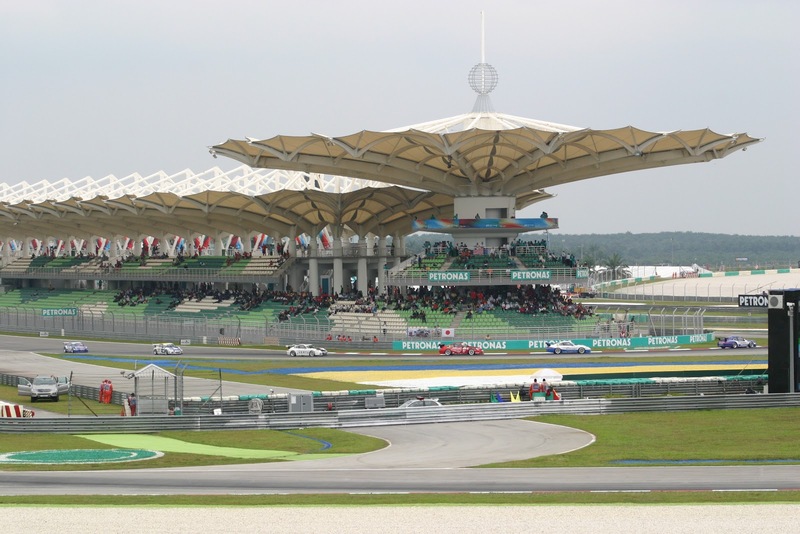 If anyone ever gets around to writing the definitive history of F1 circuit design and architecture then the Sepang International Circuit, host of the Malaysian Grand Prix for the last 13 years, will be pivotal to the story. It was the first of the purpose-built, constructed from nothing, Hermann Tilke-designed facilities which so impose themselves on the calendar these days. When it landed in 1999 everyone could sense the stride in standards that it represented. Its architecture, especially its football ground-style main grandstand winding within the final hairpin and with a floral-inspired roof, was stunning. It also then and now boasts a fine track layout, with a mix of challenging expansive turns, and plenty of overtaking opportunities, making for many diverting races here. But there are flipsides. One is, the circuit is synonymous with extreme oppressive humidity, which gets seriously to everyone present. For another, flash tropical drain storms are commonplace (and are forecast for this weekend too - though in the past two years this rain has not arrived in the race despite it being widely anticipated) though, let's be honest, they have the ability to spice things up further. You begin to wonder these days that if the Malaysian Grand Prix at Sepang didn't exist whether someone would have to invent it? The brutal answer is 'no', but it clearly still means something to someone as it persists on the calendar supported by large cheques as the event continues to, presumably, make a big financial loss year-on-year. On track, the evidence of Friday's practice is that McLaren will continue at Sepang where they left off last week at Melbourne, as the team to beat. Lewis Hamilton topped both Friday practice sessions, with Jenson Button also looking strong. This is a circuit that Red Bull have dominated at in each of the past two visits (or rather, Sebastian Vettel has). But there are suggestions that McLaren have closed on, and maybe even usurped, the Bulls on high-speed corner performance which is vital around the Sepang track. But even of the two McLarens Jenson may again be the one to watch come Sunday. On race day in Melbourne he extracted more from his tyres than Lewis which was vital to his victory, and tyres are much more critical at Sepang than Melbourne, given the higher temperatures and longer corners. Jenson also has a good record at this venue: when Lewis outqualified him here last year it ended a run of nine straight years of Jenson qualifying ahead of his team mate at Sepang. However, this weekend there is a major potential spoiler in the shape of Mercedes. At Sepang they may be even stronger in qualifying than they were in Melbourne, as they will be able to make even greater use of their DRS-activated 'F-Duct' rear wing. And remember that last week they looked to be favourites for pole before Nico Rosberg fluffed his lines in the final session. However, on race day last week their relatively poor rate of rear tyre wear came to light and they sank down the order, and today the Mercs' longer runs again didn't look as clever as their shorter stints. And Rosberg has a good qualifying record here also, having started on the first two rows on three occasions. Therefore, they could form a road block on Sunday by starting high up and backing up those behind them (helped by their prodigious straightline speed) - and where they form a road block could decide the race. For example, if Lewis qualifies ahead of Jenson and has a silver buffer between him and his team mate in the early stages on Sunday it could well swing the race in his favour. If, as in Melbourne, the Mercs get between the McLarens and Red Bulls it may make the Bulls' attempts to get on terms with the McLarens much harder. Again, like Melbourne, by the looks of things today the Red Bull can't match the McLaren over a single lap, but things are much closer over a stint. So it could be another glimpse of future past at Sepang this weekend: qualifying and the order on lap one could go a long way to deciding the victor of this Grand Prix. Who is the Architect behind the floral style grandstand?